Anna and Nickolas Wells, Kate McDougall and baby Ivy. 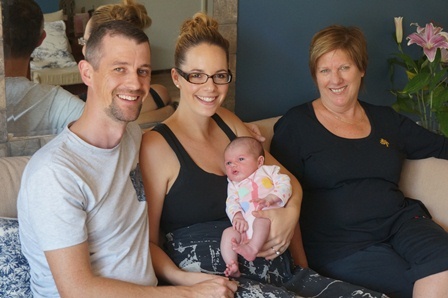 New mothers in the Perth metro area and Mandurah are being visited by midwives and lactation consultants in the comfort of their own homes, thanks to a service offered by St John of God Health Choices. The midwives and certified lactation consultants work with mothers to create personal care plans that suit the mother and her new baby. They also liaise with the mother’s paediatrician, obstetrician and GP to ensure the health and safety of the mother and her baby. Anna and Nickolas Wells, parents to two-week old Ivy, are delighted with having an expert on hand, in their own house. “It’s been such a positive experience and great for us to ask any questions we might have,” Nickolas says. Lactation Consultant and Midwife Kate McDougall says the service offers many benefits to mothers with newborns, including convenience and early discharge from hospital. “For some mothers, especially those with other children, getting out of hospital is a priority,” Ms McDougall says. In addition to a personalised care plan, the service includes a full assessment of the baby, a Newborn Screening Test for those discharged early and assistance with early feeding problems. For more information on this services or to organise a midwife to visit you, please phone 1300 475 442. December 10, 2015 in maternity.